Discover a verdant tropical island rich in wildlife. Sri Lanka is only the size of Ireland, and yet it is one of the most biodiverse areas in southern Asia with, for example, 244 species of Butterflies alone! The list of bird species tops 430, including 33 endemics, and with the help of a highly experienced English-speaking guide, who will be with us throughout the tour, we should see all of them, including the rare Serendib Scops Owl, which was only discovered in 2001! Our visit coincides with the presence of winter visitors, including waders from Siberia and songbirds from the Himalayas. 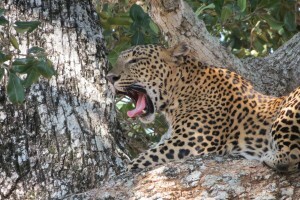 In addition to all the birds, Sri Lanka has a wealth of other wildlife and we can therefore expect to see Marsh Mugger Crocodile and various land mammals such as Grey Langur and Purple-faced Leaf Monkeys, Water Buffalo, Sambar and Spotted Deer, Wild Boar, Indian Fruit Bat, Sloth Bear, Leopard and Asian Elephant. On top of all this, our visit to the south coast is timed to coincide with a calm sea and the presence of Blue Whales, as well as several other whales and dolphins, which can often be seen from a boat at close range. We shall have two ’bites’ at this ’cherry’ and with so much to see this tropical island really is a paradise for all nature lovers. Day 1 We take an evening flight from Heathrow direct to Colombo with SriLankan Airlines, arriving in Sri Lanka around lunchtime the following day. Dinner and overnight in flight. Day 2 On arrival in Colombo, we shall be met by our local guide and transferred to Kithulgala, where we can quickly get acquainted with the local birdlife such as Sri Lanka Green Pigeon, Green-billed Coucal, Chestnut-backed Owlet, Sri Lanka Grey Hornbill, Black-backed Dwarf Kingfisher, Yellow-fronted and Brown-headed Barbets, Crimson-backed Flameback, Common Iora, White-bellied Drongo and Black-hooded Oriole, several of which are endemic to this island. Our base for two nights is the Kithulgala Rest House, a traditional guesthouse spanning four generations, overlooking the Kelani River and surrounded by nature and tranquillity. Day 3 We have a full day to discover the birdlife of the Kithulgala Forest Reserve. 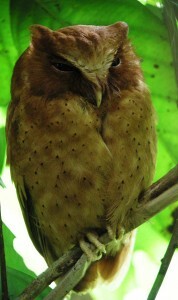 This rainforest is inhabited by many of the island’s endemics, including the recently discovered Serendib Scops Owl. Thanks to the expert knowledge of our local guide, we can hope to see this and several other owls at their roosting sites in broad daylight. Other exciting species here include Black and Rufous-bellied Eagles, Sri Lanka Spurfowl, Sri Lanka Junglefowl, Sri Lanka Hanging Parrot, Layard’s Parakeet, Brown Hawk Owl, Sri Lanka Frogmouth, Sri Lanka Swallow, Black-capped Bulbul, Golden-fronted Leafbird, Spot-winged Thrush, Legge’s Flowerpecker, Brown-capped and Orange-billed Babblers, Sri Lanka Myna and Sri Lanka Crested Drongo. We return to the rest house for lunch. Dinner and overnight at Kithulgala Rest House. Day 4 We head for the hills near Nuwara Eliya, the coolest part of the country at 6000 feet, with rolling green hills known as ‘Little England’, where our ‘home from home’ for the next two nights will be the exclusive Hill Club, a British colonial style club house with manicured lawns, founded by tea plantation owners in 1876; so remember to pack a tie or tiara for dinner! 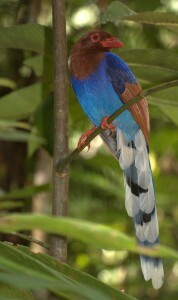 Hereabouts we can enjoy higher altitude birds like Chestnut-headed Bee-eater, Sri Lanka Scimitar Babbler and Tickell’s Blue Flycatcher. After lunch at ‘the club’, we shall take a stroll in Victoria Park, hoping for good views of Yellow-eared Bulbul, Indian Blue Robin, Pied Thrush, Kashmir Flycatcher, Brown Shrike, Green and Blyth’s Reed Warblers, Sri Lanka White-eye and the spectacular Indian Pitta. Dinner and overnight at the Hill Club. Day 5 We have a very early start, with a picnic breakfast, as we head for Horton Plains National Park, which is actually a plateau at over 5000 feet, where we hope to see the crepuscular and endemic Sri Lanka Whistling Thrush, along with Blue-tailed Bee-eater, Hill Swallow, Pied Bushchat, Indian Blackbird, Pale-billed Flowerpecker, Sri Lanka Bush Warbler, Grey-headed Canary Flycatcher, Large-billed Crow, the endemic Dull-blue Flycatcher and the gorgeous Velvet-fronted Nuthatch. As well as all these fabulous birds this scenic national park also has a 66 foot waterfall and an amazing viewpoint known as World’s End. After lunch back at ‘the club’ we shall explore the local area for birds like Bar-winged Flycatcher-shrike, Loten’s Sunbird, Rusty-rumped Warbler and Large-billed Leaf Warbler. Dinner and overnight at the Hill Club. 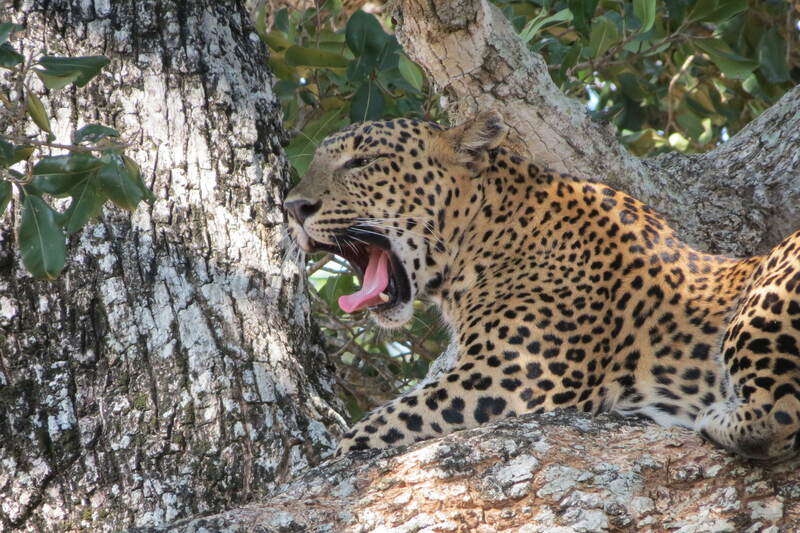 Day 7 We have a full day’s jeep safari, with a packed lunch, in Yala National Park, home to one of the highest densities of Leopards in the world, as well as plenty of other exciting mammals like Black-naped Hare, Sambar Deer, Wild Boar, Sloth Bear and the magnificent Asian Elephant. Over 200 species of birds taking a back seat on this super safari may include Indian Peafowl, Woolly-necked and Black-necked Storks, Changeable Hawk Eagle, Booted Eagle, Small Pratincole, Yellow-wattled and Red-wattled Lapwings, Pacific Golden, Oriental and Greater Sand Plovers, Marsh and Wood Sandpipers, Oriental Scops and Brown Fish Owls, Grey-bellied Cuckoo, Green Bee-eater, Crested Treeswift, Yellow-crowned Woodpecker, Marshall’s Iora, White-browed Fantail, Ashy and Racket-tailed Drongos, Jerdon’s Bushlark, Ashy-crowned Sparrowlark, Tawny-bellied and Yellow-eyed Babblers, White-rumped Shama, Brahminy and Rosy Starlings and Indian Silverbill. Dinner and overnight at Oak Ray Lake Resort. Day 8 We make an early start for a jeep safari in Bundala National Park, a Ramsar site teeming with water birds such as Painted Stork, Intermediate Egret, Black-headed and Glossy Ibises, Spot-billed Pelican, Greater Painted Snipe, Brown-headed Gull, Caspian, Gull-billed, Whiskered, Great Crested and Lesser Crested Terns, Broad-billed and Terek Sandpipers and Pied Kingfisher, as well as Jerdon’s and Indian Nightjars and Oriental Skylark. After lunch in a local restaurant, we visit the nearby Kalametiya Bird Sanctuary, an important migration staging post on the south coast, where we should find Garganey, Little Heron, Great Thick-knee, Pintail Snipe, Oriental Pratincole, Alexandrine and Rose-ringed Parakeets, Coppersmith Barbet, Sri Lanka Woodshrike and White-browed Bulbul. After yet another action-packed day we retire to the serenity of the Centauria Lake Hotel where we can enjoy the swimming pool, the amazing food and ‘ringside’ views of the lake. 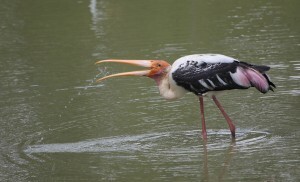 Days 10 & 11 We have the luxury of two full days to discover the staggeringly rich wildlife of the Sinharaja World Heritage Wilderness Area, ranked number 17 in the world’s top 100 birding sites! 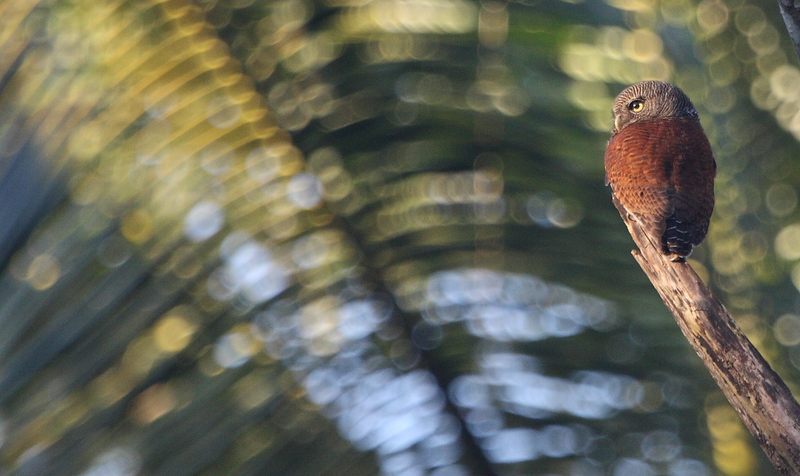 This biodiversity hot spot is the place to see the greatest number of rainforest birds and most of the island’s endemics. Notable ticks should include Crested Goshawk, Besra Sparrowhawk, Shikra, Crested Serpent Eagle, Mountain Hawk Eagle, Spot-bellied Eagle Owl, Pompadour Green Pigeon, Greater Flameback, Red-faced Malkoha, Chestnut-winged Cuckoo, Malabar Trogon, Black-headed Cuckooshrike, Yellow-browed and Himalayan Black Bulbuls, Sri Lanka Scaly Thrush, Ashy-headed Laughing Thrush, Dark-fronted Babbler, Brown-breasted Flycatcher, Scarlet Minivet, White-faced Starling and the stunning Sri Lanka Blue Magpie. In addition to all the birds, there are several mammals to see here such as Purple-faced Leaf Monkey, plus Sri Lanka Giant, Layard’s Striped and Indian Palm Squirrels. Packed lunches will be provided. Dinners and overnights at the Birds Paradise Inn. Day 12 We head south for the coast near Mirissa for a relaxing three night stay at Fisherman’s Bay Hotel, where we arrive in time for lunch today, followed by local birding or free time to enjoy the beachside setting. Days 13 & 14 Mirissa is the whale watching ‘capital’ of Sri Lanka where it is possible to see Blue, Humpback, Bryde’s, Sperm and Fin Whales, plus Common, Bottlenose, Spinner, Risso’s and Striped Dolphins as well as Green Turtles and Flying Fish. Each morning we board a boat for a whale watching excursion, followed by afternoons at leisure back at the hotel’s idyllic setting, with a swimming pool amid palm trees adjacent to a beautiful sandy beach with a sea temperature of about 28°C. Dinners and overnights at Fisherman’s Bay Hotel. Day 15 By now our checklist should have around 220 species of birds alone, and this morning we are driven back to Colombo for an early afternoon flight home, which arrives at Heathrow in the evening. Cost £2895 Only one place left. Return flights direct from Heathrow to Colombo with SriLankan Airlines, thirteen nights full board en-suite accommodation, plus one overnight flight, all transport in Sri Lanka, by air-conditioned vehicle, all excursions and reserve entry fees, including three jeep safaris in national parks, and two whale watching excursions, plus bird checklist and the services of your guides. The flight to Sri Lanka takes 10 hours 30 minutes, and the return flight takes 11 hours 50 minutes. An Electronic Travel Authorisation (ETA) can be applied for on line via www.eta.gov.lk/ for a fee of about £30, with no requirement to submit a passport. Production of the ETA on arrival in Sri Lanka allows entry. It is advisable to be vaccinated against Hepatitis A and Typhoid. Malaria tablets are also recommended. The climate is tropical, and so average daily temperatures are stable throughout the year, but vary with altitude. The usual temperatures are 23 – 29°C in the coastal lowlands, and 11 – 20°C at 6000 feet, such as at Nuwara Eliya. There is a 70% chance of rain each day, with about 7 inches during the whole of November, which is about three times the amount we get in Britain. Transport in Sri Lanka will be by air-conditioned minibus. We shall be staying in six different comfortable and charming hotels, all with private bathrooms and offering western as well as local cuisine. All of the hotels are of an international standard and some have swimming pools.